I made a presentation at the Mirae Sotong (Future Communications) Forum on July 28, 2011 in which I described my thoughts on the “Intellectual Korean Wave.” I suggested that the time has come to go beyond the Korean Wave of pop songs, dramas and Kimchi and start to introduce the best of Korean artists, intellectuals and writers to the world in a serious fashion. See these materials for more in Korean on the talk. “The Intellectual Korean Wave” is Forthcoming as an article from Korea IT Times and Munhwa Ilbo Newspaper. The Korean language article follows after the break. A short essay about the time I spent with Murakami Haruki back in the summer of 1993. 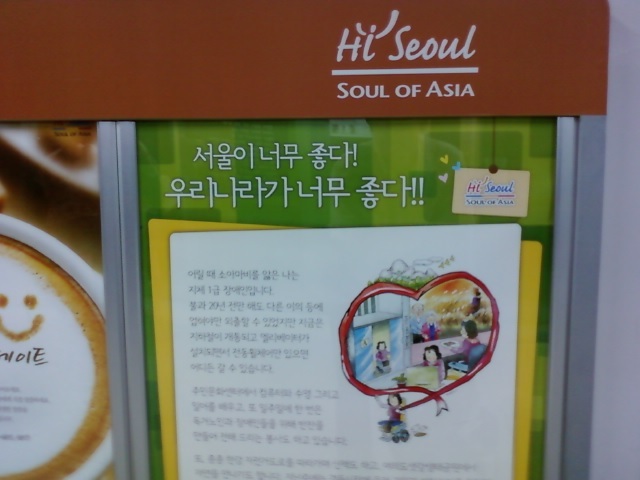 When first I came to Korea to study for a year back in 1995, you could walk a mile to find a cup of coffee in Seoul. In the morning, there simply were no places to go out and get coffee and no habit of meeting with individuals for coffee to talk, or simply to read a book. If one drank coffee, even five years ago, the standard was to rip off the end of a round packet about seven centimeters in length and one centimeter in width. Inside was a delightful coffee mix, famous for its use of transgenetic fats. Then there were the dabang 다방, but those old coffee shops were the domain of men from a previous generation and not particularly welcoming to us. But now coffee shops are springing up everywhere and just about every coffee shop offers café latte and cappuccino—although the quality may vary. In some cases, there seems to be no economic logic to the number of cafes springing up. The pastries also have improved by leaps and bounds, now rivaling what is found in other major metropolitan centers around the world. 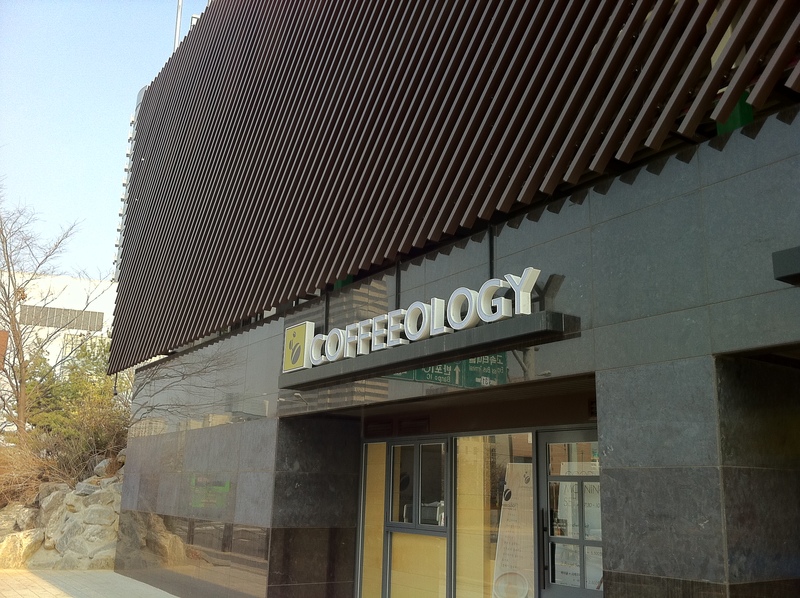 What we can say is that the coffee shops often do not open until 8:30 or 9:00, so do not go too early. This particular coffee shop took my fancy. Here we see the long-predicted “death of ideology” when the very concept of ideology becomes a consumer good, proper for a fashionable place to consume espressos . Koreans have not been so big on maps. Whereas in Japan highly accurate maps have traditionally been a mainstay for citizens and a symbol of good living, Koreans prefer to ask the way, or if necessary, use a navigation device. But that aspect of Korea is now changing as well. 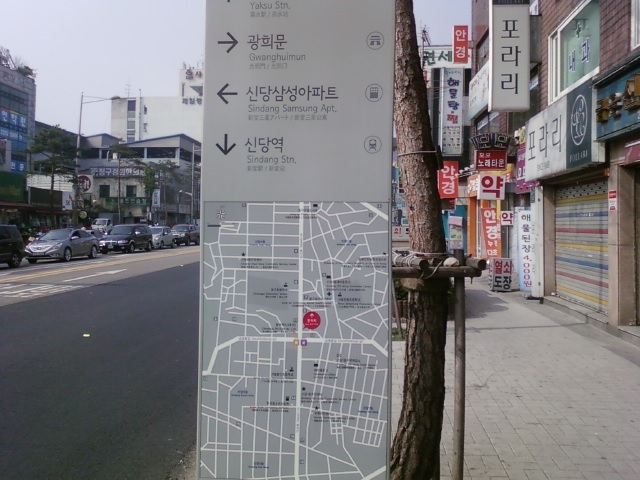 Rather well organized maps are going up around Seoul that are as good as anything one finds. In fact, several subway stops now feature both maps and photographs taken from above to allow the observer two means of understanding the geography of the neighborhood. 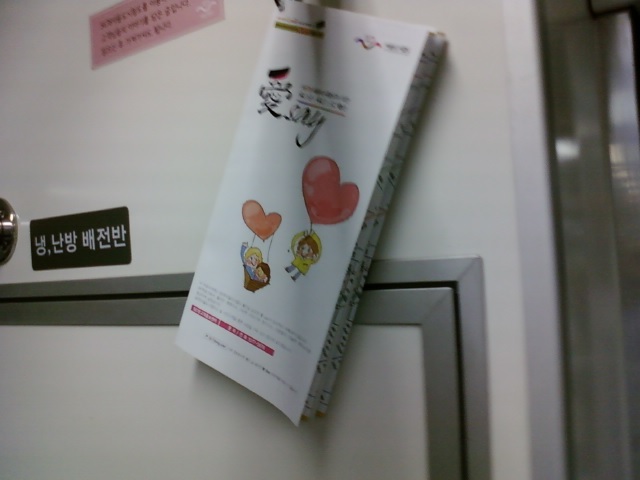 Seoul Metro also has come up with an innovative manner of providing maps to riders. It is almost August and Seoul is lost in the most serious torrential rains I have ever witnessed. I was starting to grow my own vegetables at home and at work, but agriculture is rather negatively impacted by this level of rain, at least agriculture as we have known it. Needless to say, although climate change is everywhere in the media, I don’t hear anyone saying in daily conversation that this odd rain is related to climate change. Just not a polite thing to do, and so I do not mention climate change much either. Of course climate change is not a simple matter of CO2 emissions. After all, the climate change that turned the Middle East into a desert began before the massive CO2 emissions. But that the desertification of Saudi Arabia was linked to human activity is beyond doubt. It would be nice if all the consumption that is so negatively impacting the environment were at least helping people to live better. But, unfortunately, there are homeless, and those who struggle to feed themselves, who wander around Seoul and of course many other countries, trying to make a living. The homeless are the most seriously impacted by the heavy, unrelenting rains. For many of them it is matter of survival. There are a large number of elderly in Korea who survive by pulling wagons on which they gather old newspapers and other recyclable goods. For these individuals climate change is a matter of life and death. Of course what impacts them today, may impact us tomorrow. Yoyo Ma is a close friend of my father’s whom I have known since I was a child. Whenever he visited San Francisco he was certain to stop by our home. He knew me before I could speak a word of Chinese and he met me repeatedly as I learned Chinese, Japanese, and finally Korean. As a Chinese who has spent his career between the Chinese and Western cultures Yoyo Ma understood my work between cultures better than most people and we are able to communicate with a greater degree of depth than might otherwise be the case. I felt great closeness to Yoyo because we both found ourselves deeply imbedded in more than one culture. Yoyo, as a Chinese who had fully embraced the Western classical music tradition and spent his time at Harvard, and later in life, reading Aristotle and other great thinkers and me as a European who had embraced the Asian tradition and spent so many years trying to understand the classics, both of us had to find a space between the two cultures. Seoul traditionally was not very attentive to the handicapped, but I have been impressed by recent efforts to make life more convenient for all citizens. There seems to be an effort to create a more open environment. 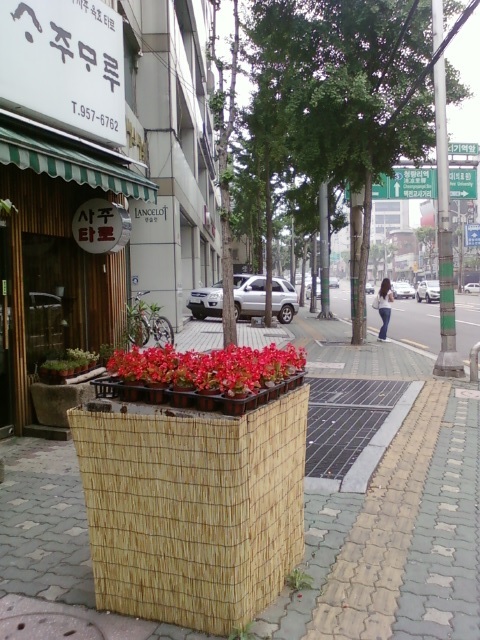 Here a young handicapped woman exclaims, “Seoul is such a wonderful place.” She is referring to the ease of life. It would not be accurate to say that Seoul is particularly convenient, but an effort is being made these days. 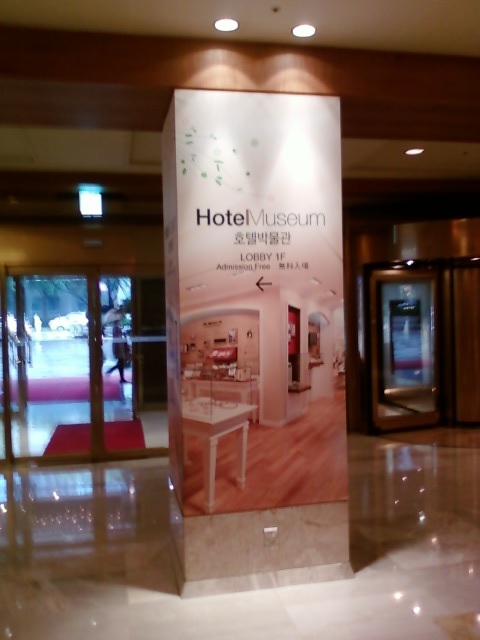 The Lotte Hotel now features a museum on the first floor! I am not sure what to make of the underwear emblazoned with the currencies of the world that are for sale in Itaewon these days. I suppose they symbolize the coming collapse of currency itself as the process of mechanical reproduction reaches an extreme in this fluid age. Seoul has suffered from a serious misconception of the meaning of real estate. It seems as if green space was deemed a waste in the building of houses and offices throughout the city. The are big parks, of course, but along most streets trees are not at the center at all. But we have seen over the last few years efforts to introduce plants at stores, in the metro, in every corner of the city. Often the efforts seems spontaneous. There is a buried lover of plants and agriculture in Korea. Getting away from green was part of moving from the agricultural to the industrial economy. For the reason, neighborhoods should look green, but not too green. But at the same time, there is a nostalgia for the agricultural past just beneath the surface of Korea. 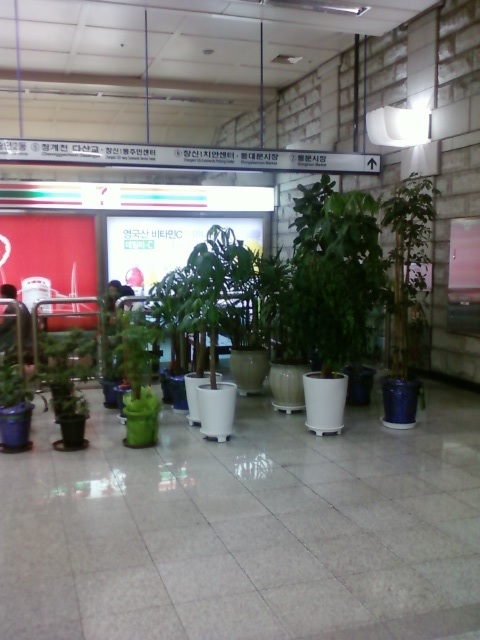 Of course, the plant are often placed in a make-shift manner, suggesting they can disappear at any moment.